Hell on Heels is lots of fun for everyone! The December edition of this lip syncing, dancing, and singing adventure, CHRISTMAS Spectacular is filled with loads of comedy and just the right amount of crassness! Drag Queens have been a huge part of our culture for decades. Let us show you why!! Host MercedesBenz-Over is back along with featured stars Kelly Ann Jefferies AND Vajojo Visage. Hell on Heels is lots of fun for everyone! 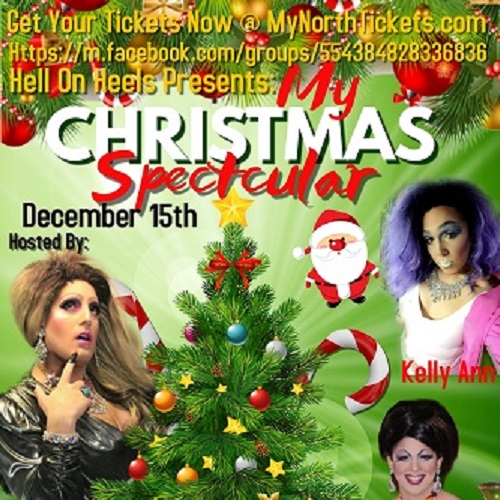 The December edition of this lip syncing, dancing, and singing adventure, CHRISTMAS Spectacular is filled with loads of comedy and just the right amount of crassness! Drag Queens have been a huge part of our culture for decades. Let us show you why!! Host MercedesBenz-Over is back along with featured stars Kelly Ann Jefferies AND Vajojo Visage.